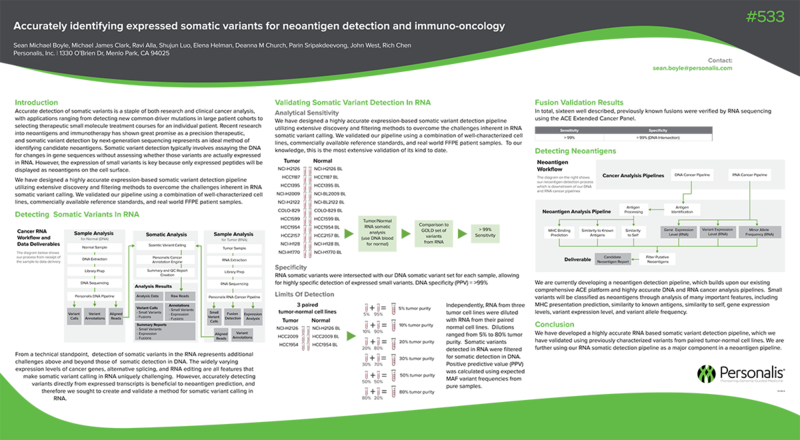 Accurate detection of somatic variants is a staple of both research and clinical cancer analysis, with applications ranging from detecting new common driver mutations in large patient cohorts to selecting therapeutic small molecule treatment courses for an individual patient. Recent research into neoantigens and immunotherapy has shown great promise as a precision therapeutic, and somatic variant detection by next-generation sequencing represents an ideal method of identifying candidate neoantigens. Somatic variant detection typically involves assaying the DNA for changes in gene sequences without assessing whether those variants are actually expressed in RNA. However, the expression of small variants is key because only expressed peptides will be displayed as neoantigens on the cell surface.